The seventh installment of Gardner Fox's series about Niall of the Far Travels appeared in issue #38 of Dragon (June 1980), in a short story called "The Cup of Golden Death." As with so many of its predecessors, this one begins in medias res, just as Niall, still in the employ of King Lurlyr Manakor of Urgrik, and traveling with Maralia, high priestess of the god Humalorr, uncovers a cup buried in the ground. His huge hand went out to the sand, brushed more avidly at it. The tiny grains flew away, disclosing a rounded bit of metal. The breath came short and fast now to his lungs; excitement was awash inside him. A girl came running across the flat moorland, her red hair glinting in the sunlight. She wore a thin, short skirt and a vest, and little more. The vest was held together by silver chains, and it was decorated with silver thread that bespoke her rank as high priestess of the god-being, Humalorr. She fell to her knees beside him, her eyes hungry at the sight of that which he had partially uncovered. Her tongue came out to moisten her ripe, red lips. "Have you found it? Is it thecup of the god?"
Niall grunted. "Who knows? I'd stake my life on the fact that its a ceremonial cup of some kind, but whether it belongs to your god or not, you yourself have to decide."
Niall seeks the cup, because of its rumored ability to heal any ailment. His master, Lurlyr Manakor, "lay in a deathlike trance" of unknown origin and would surely die without its aid, or so claimed the king's physician, who'd tried every other remedy at his disposal but to no avail. Of course, like all pulp fantasy barbarians, Niall distrusts magic of any kind and believes the cup to be a bane rather a boon. Nevertheless, he does as he is commanded, keeping his eyes open for evidence of treachery. And a good thing, too! Maralia has other plans for the cup, owing to the plans of her master, the high priest of Humalorr. Yet she was sworn to do what had been whispered into her ears by the high priest short days ago, when they had been last in Urgrik. Niall was to go with her to the moors of Lurydia. There they were to find the ancient cup which once had been used by the wizard. Yellixin, in the ancient days when there had been a citadel standing where they now knelt. Maralia swallowed. She was to kill Niall and bring the cup back to the high priest, to Aldon Hurazin himself. And Aldon Hurazin would hide the cup so that it might not be used to save the life of Lurlyr Manakor. From this conflict between Niall and Maralia -- or, rather, her superior, the high priest Aldon Hurazin -- regarding the cup does the whole of this story flow. It's a very good story, in my opinion, both for the relative complexity of its plot and for the picture it paints of the nature of magic and the gods in Niall's world. Naturally, one should not expect philosophical depth or profundity from a pulp fantasy such as this one, but Fox nevertheless manages to elevate this tale above mere swordplay and spell slinging. I think "The Cup of Golden Death" is one of the best stories in the series for sheer entertainment value, as well as the way it continues to raise the stakes in the unfolding saga of Niall's adventures. 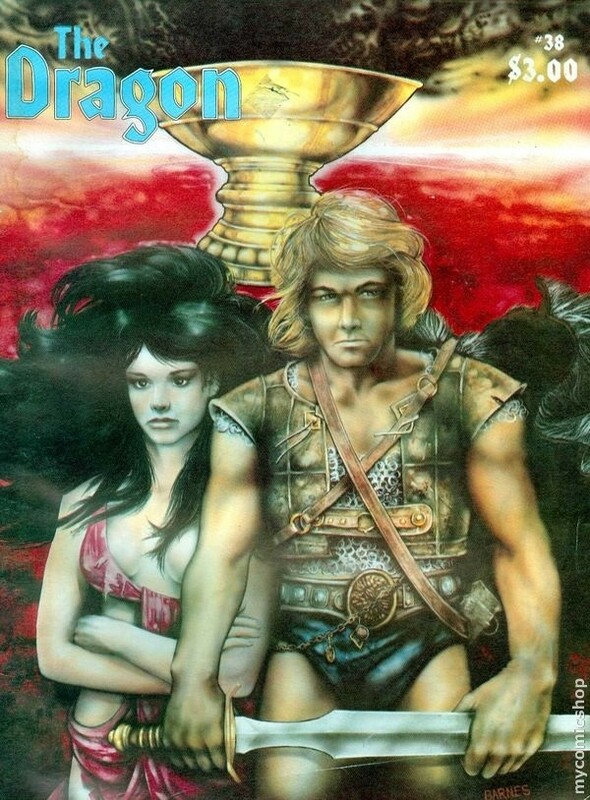 The first issues of Dragon err The Dragon magazine I ever got. I got everyone until I stopped in the mid 90s. Have you ever read anything of the Destroyer series, dealing with the adventures of Chiun and Remo Williams? Or, if you are into old horror; Stefan Grabinski, also called "the Polish Poe"?